C.A. 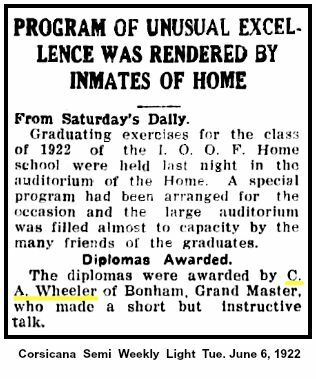 Wheeler died at his residence on North Center street at 2 o'clock this morning, Oct. 30th, after an illness dating from last January. He had to be confined to his room since July. The funeral service will be conducted at the family home at 10 o'clock Friday morning by Rev. Holder of First Christian Church and Rev. Smith of First Baptist Church. Interment will be at Willow Wild Cemetery. In his death Bonham and Fannin county have lost one of their most useful and faithful citizens. We know of no other man in the country who has more universally esteemed by his friends and most of the citizens of the county were his friends. 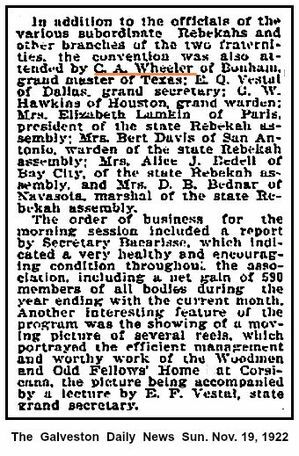 Not only was he known and esteemed in his home but he was well known all over Texas because of his services in the legislature and also for his having served one year in 1922 as Grand Master of the Independent Order Of Odd Fellows. No man who has held that important position ever made a better record or was more sincerely esteemed by the brotherhood. In that order he was as in everything in which he took part earnest, enthusiastic, studious and efficient. 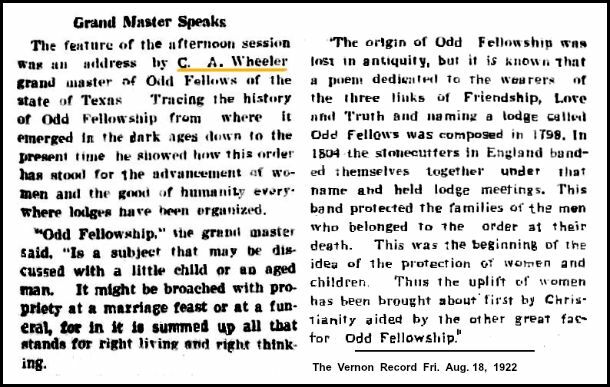 Chas Allen Weeeler was born in Glasgow, Ky. On January 22, 1861. He attended school at Bethany collage in that town until he came to Texas with his parents in 1881. The first year after he arrived here worked on a farm. Later he engaged in teaching school. While still engaged in teaching he began the study of law. As soon as he could, he entered the law office of Lusk & Thurmond and studied until admitted to the Bar. His public positions were first city attorney of Bonham, then State Senator from this district, and last, for four years as county judge. His last term as judge expired in January, 1931, when he voluntarily retired because of health. In all those capacities he served as faithfully as any man who ever occupied a public office. He was as honest, as conscientious, as faithful to his trust, and had a high sense of honor with the courage to act as honor or duty dictated, as any man who ever lived. 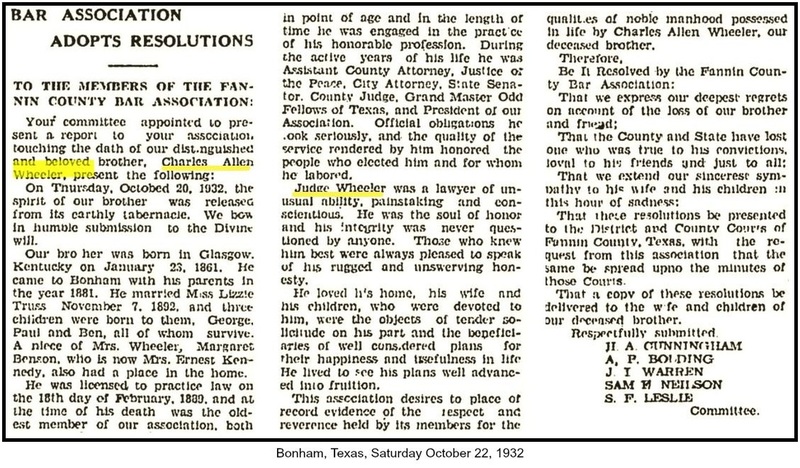 No one ever questioned Allen Wheeler's honesty, his sincerity, his devotion to his duty, his good purposes. He was respected by his fellow members of the Bar, who regarded him as one worthy of his high calling. 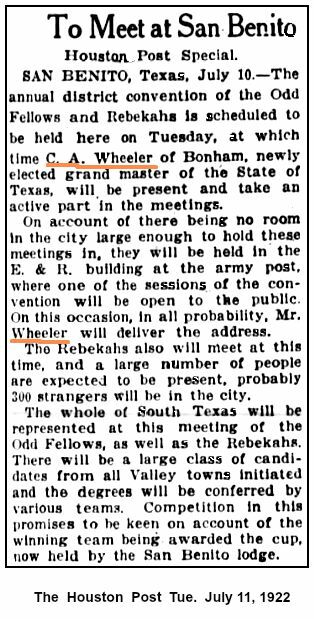 Judge Wheeler was president of the Bar Association of Bonham for several years and the oldest practicing attorney in the city. He was a man of an exceedingly kind disposition and charitable nature. He never failed to do a favor to any man whom he could aid, and he never harbored malice. Tenderhearted, he was ever the friend of the helpless and needy and he loved the little children. There are hundreds of these in the Childrens Home at Corsicana, Texas, as well as many at homes who testify eloquently to this truth. Many of the burdens of others he helped bear, much good advice he gave freely to those in need of it and who sought it, bounteous the work of encouragement he gave the troubled. There have been few men we have known to whom we can point our sons as a better example to be emulated in purity of his life, the fidelity of his service, his high ideals of honesty and honor, of mercy and charity. He was a loving spirit, and he went about doing good. On October 26, 1892 he was married to Miss Lizzie Truss. To them three sons were born, all of whom together with mother survived him. 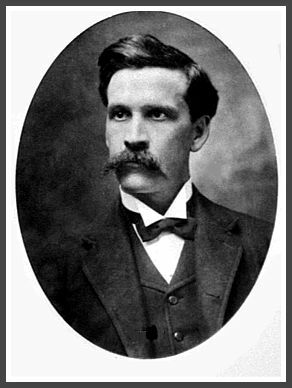 George the eldest is head of the Department of Zoology in the University of north Dakota at Grand Forks. Paul Allen, the second son, is resident in pathology at the Barnes hospital in St. Louis. His step-son is Ben Kerr who is a traveling representative of Ginn & Company publishers, in the state of Arkansas, with headquarters at Little Rock. He is the only one of the three sons who could attend the funeral of their father. In addition to these sons, he and his wife reared in their home a niece, Miss Margaret Benson, who is now Mrs. Ernest Kennedy, of El Paso, Texas. She was to them a loving and beloved daughter, For some weeks she has been a constant attendant at his bedside. Those who have been much in their home know in that place he showed always the tenderest devotion and most loving care. To no one in that home did he show more difference and exhibit more love than to his wife's mother, Mrs. Josephine Truss, who has made her home with them for years.